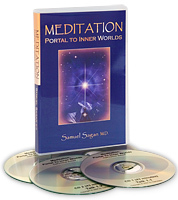 Pre-register* by email now for 15% off the regular price AND attend the Awakening the Third Eye Workshop to receive a free copy of 'Meditation: Portal to Inner Worlds' (4 CDs) worth $30! "Your meditation weekend took me by surprise. I've tried meditation before but this was the first time I found what you called the inner space. It was a beautiful experience. Thank you." "I want to reiterate how much we enjoyed the weekend and value what you are teaching." ATE Refresher rate: Only $100 – the perfect opportunity to brush up on your knowledge and practice the techniques. * We will email you shortly with more information (no payment required to pre-register).